Inspired by our friends at All Things Jeep, we got into the Halloween spirit and wanted to share our Jeep Wave pumpkin. Check out our gallery after the break and don’t forget to head on over to the All Things Jeep Facebook page to view the other great pumpkin carving entries. There is some really impressive artwork! Not a Jeep Wave per say, but we wanted to think about why we wave at other Jeeps. There is camaraderie, sharing excellent taste in vehicles, but what about beauty? In its rugged simplicity, a Jeep is at it’s core, beautiful. An editor at the Gizmodo Tech blog commented on this photo: “The chunky, utilitarian Jeep design mixes with the perfect sharpness of the photo in a wonderful way. 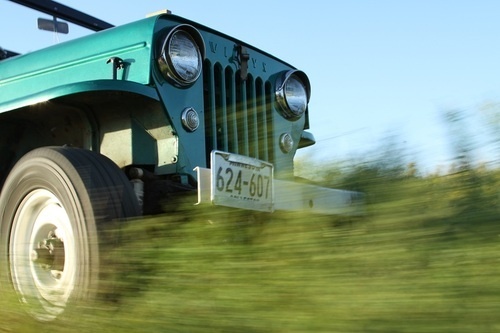 When you notice that the wheel and grass are a blur, it almost seems impossible that the vehicle is in such excellent focus.” Jeep Wave at Beauty! We came across this video recently and besides being amazed at how fast these guys took apart and rebuilt a jeep, it got us thinking. If we can do this in 4 minutes, why is it so hard for drivers to take 2 seconds to wave? Maybe we’re distracted by our cell phones and everything we’ve got going on in our lives. Or, maybe not enough new drivers know about the wave. Either way, enjoy the video and remember, if these guys can rebuild a jeep in 4 minutes, we can take 2 seconds to recognize the best vehicle in the world driven by the best drivers in the world! Jeep Wave every day!